Except for the slimy goo and full bladder, Maureen Markus remembers her first ultrasound fondly when she was 10 weeks pregnant. “My husband was with me and together we heard our son’s heartbeat for the first time!” Before she left the doctor’s office, Maureen was given the first image of her unborn child. Until now, it’s been understood that the medical procedure known as ultrasound is safe and painless. But is it so for both mom and baby? No one’s really certain. No one knows for sure what effects ultrasound have on the developing fetus. But since the time when Maureen had her first child, we’ve learned more. Research is raising questions about the procedure’s safety. In fact, this past December 2014, the Food and Drug Administration (FDA) issued its first ever caution on ultrasound during pregnancy. But first, what exactly is Ultrasound? Aptly named, ultra-sound waves reach a high frequency of about 20 megahertz or 20 million cycles per second; greater than the upper limit of human hearing. Ultrasound machines adapted for use as a medical test must generate waves only in pulses because one continuous ultrasound wave could produce too much heat potentially damaging the tissue being examined. Depending on the machine used, ultrasound during pregnancy can pulse to pick up a baby’s heartbeat and create an image of the baby and placenta. The pulses bounce off the fetus providing immediate feedback on a monitor, and a black and white image is printed out and offered to the parents to keep. Ultrasound used earlier in pregnancy help determine your due date, or the age of the fetus, as well as whether you’re having more than one baby. Later on the procedure can show the baby’s position, the amount of amniotic fluid, and estimate the baby’s health and weight. It’s important to know ultrasound is not medically necessary if all is well with mom and baby. 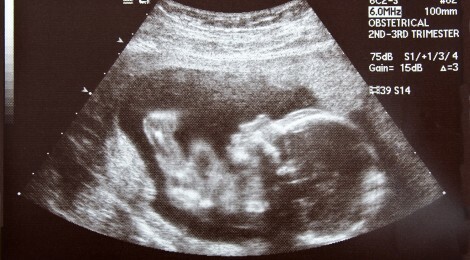 Yet ultrasound is the most widely used medical imaging method during pregnancy. How many ultrasounds you receive depends on your healthcare provider’s evaluation with you and your partner’s input. There is no medical recommendation to receive an ultrasound, and there is no recommended number that should be performed. While the procedure may be safe and painless for the mom, questions about safety and pain for the baby have been raised. ONE: Ultrasound vibrates the fetus. Ultrasound waves are vibrations that pass through matter and transfer their energy from one point to another. If there is no physical matter to bounce off, then nothing can vibrate and there is no sound. TWO: Ultrasound may be loud enough to affect fetal hearing development. …the force, from the impact of the ultrasound pulses, produced an audible localized high‐intensity noise due to secondary vibrations in a woman’s uterus. How loud was this high‐intensity noise? When the ultrasound probe pointed right at the hydrophone, it registered 100 decibels. Put in perspective: 20 decibels sounds like a whisper, 110 is the average human pain threshold, and 150 decibels is eardrum rupture. “It’s fairly loud if the probe is aimed right at the ear of the fetus,” says Greenleaf. THREE: Prolonged use of ultrasound can result in unsafe energy levels. The FDA is clear – fetal ultrasound Dopplers for use at home could pose risks to your baby. The agency also strongly discourages keepsake ultrasound scans explaining both could expose the fetus to prolonged and unsafe energy levels. FOUR: Ultrasound is capable of deforming cell membranes. Dr. Manuel Casanova, M.D., Professor of Anatomical Sciences and Neurobiology at the University of Louisville and the Gottfried and Gisela Kolb Endowed Chair in Outpatient Psychiatry spoke with my friend and author Jennifer Margulis, Ph.D. about ultrasound. FIVE: Ultrasound is capable of deforming brain cell membranes which may lead to autism. SIX: Yale researchers also found a significant number of neurons failed to acquire their proper position in the brain. Instead, the neurons remained dispersed throughout, after mice were exposed to ultrasound waves for 30 min or longer. Eugenius, et al, Department of Neurobiology and Kavli Institute for Neuroscience, Yale Medical School, demonstrated that while the amount of scattered neurons was variable, the scatter methodically increased with the duration of ultrasound suggesting long ultrasounds may harm the developing brain. Yes, ultrasound can affect proper neuron migration to appropriate positions in the developing brain. This process is critical to normal brain function. And we are learning this process is also vulnerable to environmental and physical factors. “The bottom line is you only get one chance to develop a brain,” Philippe Grandjean, M.D., of the Harvard School of Public Health. SEVEN: Ultrasound can make tissues hot enough to cause damage. Ultrasound does not improve health for babies. A case for the procedure can be made for its ability to detect abnormalities early enough for parents to choose to abort, but detection is limited. Of the more than 5,000 potential chromosomal abnormalities, ultrasound can detect only a few like Down’s syndrome. Ultrasound can also misdiagnose abnormalities when there are none, or detect abnormalities about which nothing can be done. Parents may be left with some tough decisions. Ultrasound should only be used if medically indicated. Healthy pregnancies do not require ultrasound. If you or someone you know is considering ultrasound during pregnancy, please share this science to help them make an informed decision. Autism now affects 1 in every 42 boys. There’s a lot we don’t know yet. So we turn over every rock. Take every precaution. Ensure there will be no harm. It’s your baby. Your body. Your decision. Jackie Lombardo is a SafeMinds Board member, writer, and a member of the Sierra Club’s National Toxics Committee. As a mother of three, Jackie has a keen interest in children’s health and remains involved in national projects stressing education, precaution and strong legislation for consumer products containing pesticides, mercury, bisphenol A, and lead.